Advanced Devices & Sustainable Energy Laboratory (ADSEL) at VT focuses on heterogeneous integration of III-V compound semiconductor based materials and device architectures on silicon (Si) and germanium (Ge) substrates for energy efficient quantum and nanoelectronics. At ADSEL, the research concentrates on developing III-V quantum-well field-effect transistors for "enhancement" and "replacement" in future information processing systems and diverse materials growth for energy efficient nanoelectronics. We are interested in adding new functionalities on Si chip by investigating the mixed-anion and mixed-cation based III-V quantum-well transistors and a new generation energy-efficient tunnel transistors. This can be achieved by establishing novel III-V materials and oxide growth capabilities, new device structures to discover new physical mechanisms and innovative materials and device integration strategies for incorporation of different semiconductors and device types onto Si process technology. ADSEL's research also focuses on multijunction III-V photovoltaics and thermophotovoltaics for alternative energy solutions by incorporating quantum-well and quantum-dot structures to enhance the conversion efficiencies. Our goal is to help the technology achieve its promise by expanding the material options and exploring new device architectures and their innovative integration strategies on Si substrate. 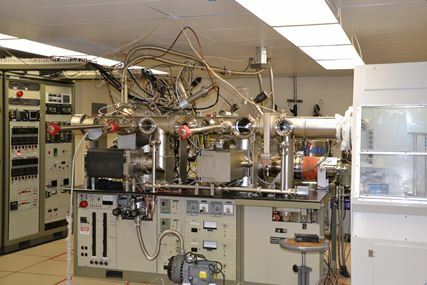 Our in-situ state-of-the-art electronic materials growth capability utilizes separate molecular beam epitaxy (MBE) growth chambers for Ge and III-V (As, P and Sb), connected via ultra-high vacuum transfer chamber. This capability enables us to grow the best possible heterointerfaces of heterojunction devices through precise atomic level growth control and avoid cross-contamination of sources. This research program is interdisciplinary in nature emphasizing on building strong collaborations and networks with device physicists, chemists, physicists, biologists and transport theorists.